Depot Club & Restaurant in downtown Harbor Springs, Michigan. Private dining club, granite bar, elegant main dining room, seasonal outdoor seating. To ensure that the Depot will be a lasting treasure for Harbor Springs and its residents, the Depot Club & Restaurant is a Private Dining Club, dedicated to providing the absolute finest dining experience in Northern Michigan and to helping the local population through the creation of solid, well-paying, reliable jobs. Offering three distinct levels of membership, the Depot Club & Restaurant invites you to join us as a Founding, Heritage or Seasonal Member. Descriptions and benefits of each membership level is shown below. If you would like additional information about membership, or prefer to speak with a membership director, contact the Depot Club & Restaurant at (231) 242-4233. I. An authentic scale steam engine engraved with the Founding Member’s family name that will serve as a personal table centerpiece and will be permanently on display inside the Depot Club & Restaurant. II. A private wine locker engraved with the family name of the Founding Member in polished brass. III. An invitation to purchase wine at a discounted Club price to be stocked inside the Founding Member’s private wine locker. IV. The exclusive privilege to reserve the Depot Club & Restaurant’s Hemingway Room for personalized dining experiences. V. The exclusive privilege to host private events and/or reserve the Main Dining Room, the Hemingway Room, the Patio, or the entire Club at any point during the calendar year. VI. The privilege to sponsor non-members as guests to the Depot Club & Restaurant when the Founding Member is not present. VII. The ability to assign, only once, the Founding Membership to a Member’s parent, brother, sister, son or daughter at a cost of 10% of the original membership contribution. I. Recognition for their contribution toward the restoration of the historic Harbor Springs Depot. II. 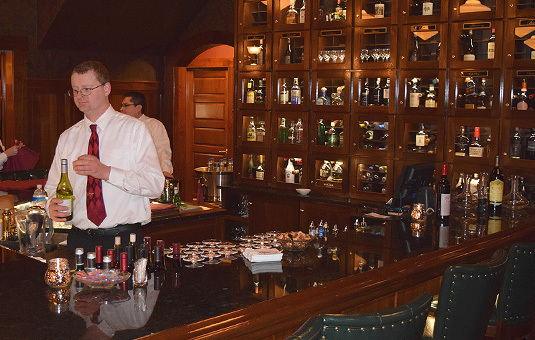 Complimentary use of the Depot Club & Restaurant’s Hemingway Room for private parties and functions. III. The privilege to sponsor non-members as guests to the Depot Club & Restaurant when the Heritage Member is present. $150 entitles you to a Seasonal Membership allowing you to dine until the second week in June 2019. Blackout date for seasonal members include New Years Eve. Simply call 231-242-4233 to make a reservation for after Labor Day. Membership paper and billing all can occur on evening of reservation. Contact Lori Stark for more information.